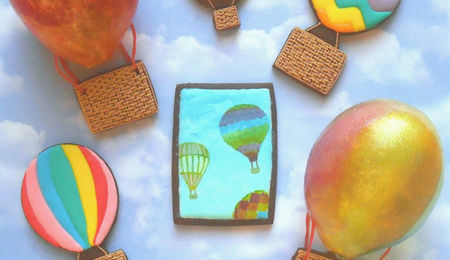 In light of our latest Inspiration Challenge theme — hot air balloons — we wanted to give you a little something to get your creative wheels turning. 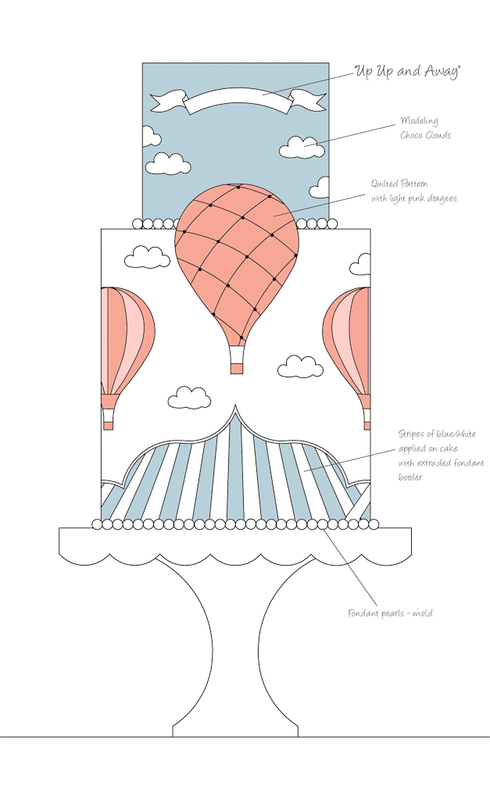 We talked to Jessica Harris about the sketch and design process behind her hot air balloon cake, which was showcased in Cake Central Magazine’s Volume 3, Issue 2 “Sketch to Cake” section. Check out what she had to say about this adorable baby shower cake! “Kim (my sister-in-law and event planner) mentioned creating a dessert table with lots of tasty treats for this baby shower. I had planned on making some cupcakes with a sweet balloon-inspired topper to match whatever the invitations were going to look like, but as soon as I saw the invitation she designed, I knew cupcakes were not going to suffice! I knew I “needed” to make a cake! I loved the invitation and the angular stripes with the sweet cloud. “Because the stripes were such an integral part of the invitation, I wanted to make sure they were on the cake. The most challenging part was figuring out how to make them work together in a circular/repetitive fashion. That’s when I went to my AutoCAD to map it all out. I was then able to create a template in order to cut and apply the stripes to the cake. I was happy with how they pretty seamlessly worked around the cake. “The shower [guest list] was small, so I knew the cake wasn’t going to be very big. That’s why I opted for a double-height, six-inch cake. 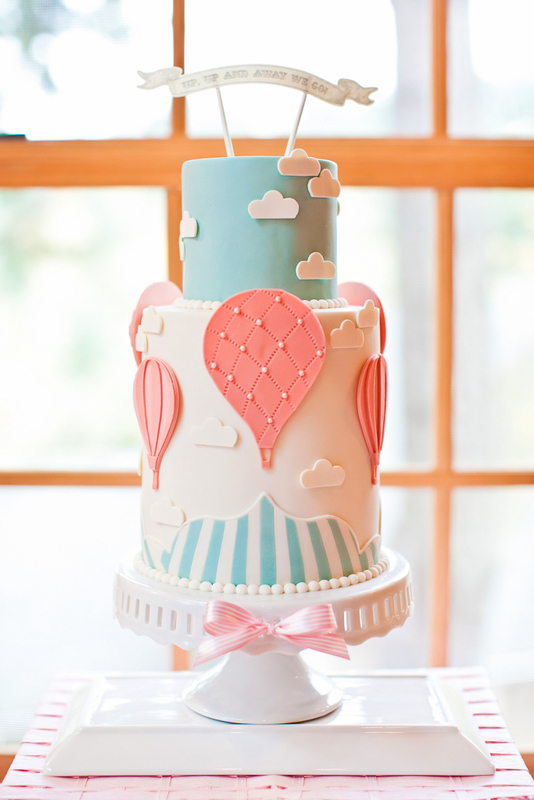 I love tall cakes and knew it would work beautifully with the hot air balloons and the stripes. The top tier was for our gluten-free friends! A little four-inch crisped rice treat cake with ganache between all the layers. And I used that tier to pull up the colors from the stripes and create an overall sky theme. “One thing that changed right at the end was the little banner I had designed for the top tier. It was going to say “Up, Up and Away” to match the invitations. The reason we changed that was so that the text and fonts would be fluid throughout the table. If I would have handwritten or hand-painted it, then it would have been different. So, we put the paper banner on the top of the cake. “Looking back, I would have had an edible image printed at our local bakery. Hindsight is always 20/20! I think I would have preferred to have had it on the cake as I had designed, but it did work overall with the table. “All in all, the cake tasted amazing, fit beautifully with the decor, and surprised many guests! It was such a fun blessing to be able to create this sweet cake for my wonderful cousin! Jessica Harris (mrsmudrash) is a self-taught cake designer whose popular blog, jessicakesblog.blogspot.com, documents her journey into the world of cake decorating. 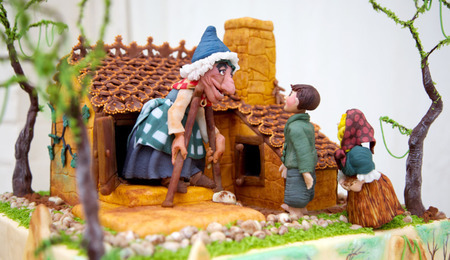 To see more of her designs, check out Volume 3, Issue 2, Issue 6 and Issue 8 of Cake Central Magazine. Just love the idea and the cake is so pretty! 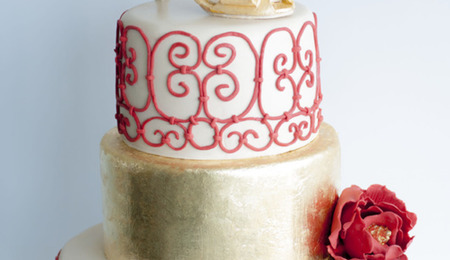 I love the cake, color palette and the simplicity of it adds to its awesome-nicity! Brilliant all the way from ground to sky.